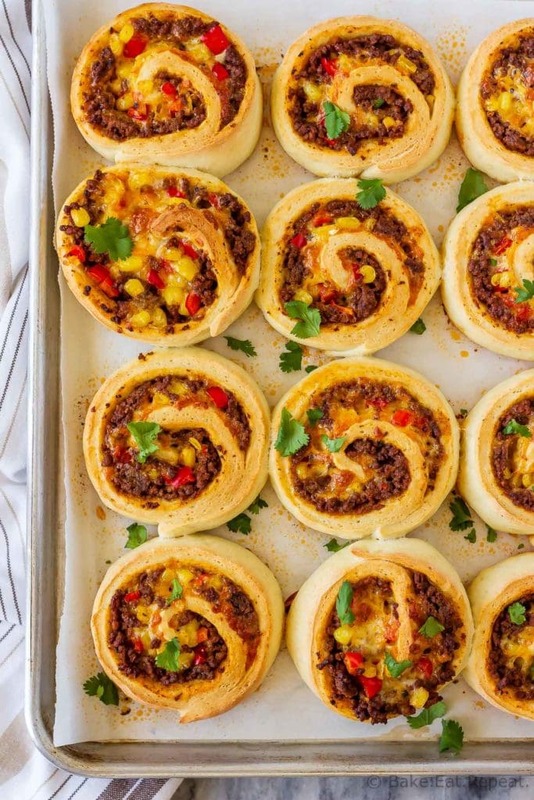 These taco pizza rolls are easy to make and taste amazing! 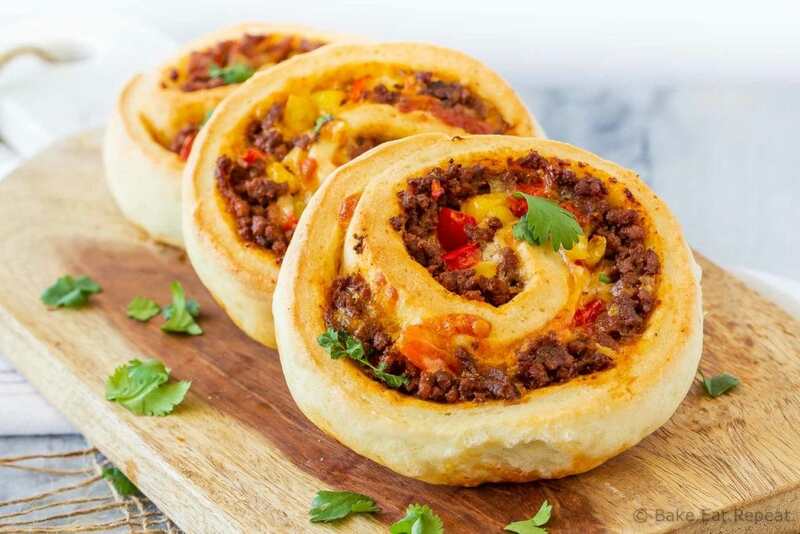 Homemade pizza dough wrapped around taco meat, cheese and veggies – perfect for lunch or dinner! Disclaimer: This post has been sponsored by Bothwell Cheese and I have been provided with product and compensated monetarily. All opinions are, as always, my own. These taco pizza rolls are amazing. I’ve made them three times in the last month I think, and they were gobbled up insanely fast each time. I barely managed to hide some in the fridge for lunch the next day before they were completely polished off at dinner. This recipe makes 12 fairly large taco pizza rolls. I have a family of five. It’s crazy that we didn’t easily have leftovers for lunch. They’re just that good. 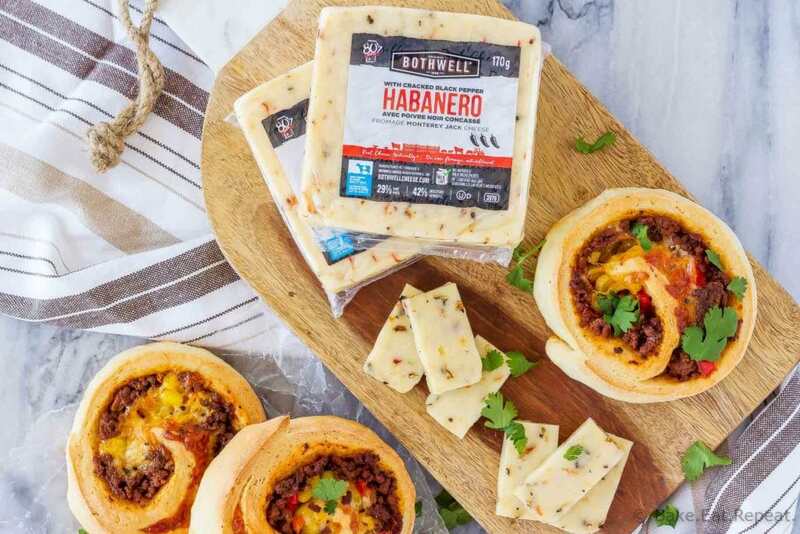 Not too surprising though – combine pizza dough with taco meat and the incredible Habanero with Cracked Black Pepper Monterey Jack from Bothwell Cheese, and there’s really no way these pizza rolls could be anything but amazing. We love spicy food, and we were still surprised at how spicy this Monterey Jack cheese is. It recently won a silver medal at the World Championship of Cheese Contest in Wisconsin in the high heat category. It has a high heat flavour with a creamy Monterey Jack base, so if you like spicy food, you will love this cheese. It’s so tasty, and spicy enough that I had to use it for just half the cheese in this recipe so that the pizza rolls wouldn’t be too spicy! If you really enjoy your food spicy you could use only the Monterey Jack though – you just might want some sour cream alongside! Bothwell Cheese is made with quality 100% Canadian milk, and is produced right in Manitoba with fresh milk from local farms. 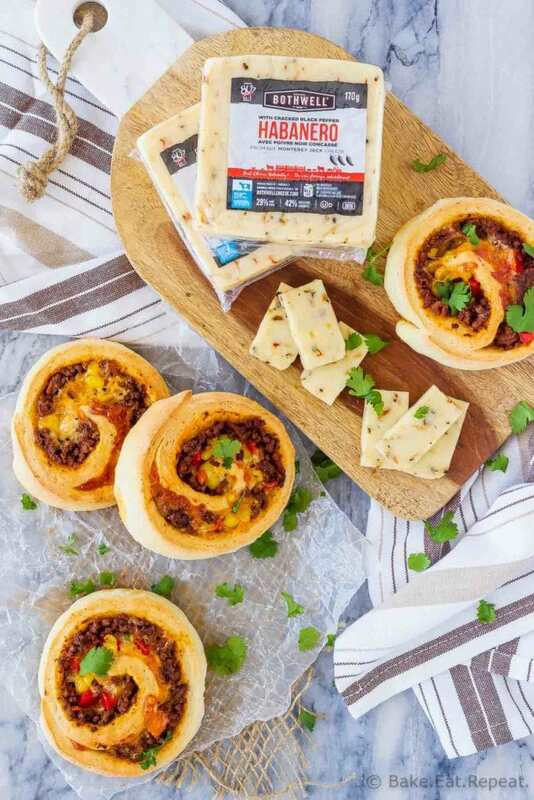 Find some of their award winning Monterey Jack at one of these stores to try out these amazing taco pizza rolls – or just to slice and enjoy by itself. I know I’ll be picking up some more to make these taco pizza rolls again. Considering how much my family enjoyed them, there would be some disappointed people if they didn’t make an appearance at the dinner table again soon! I used half Habanero with Cracked Black Pepper Monterey Jack and half cheddar cheese in my pizza rolls and that was perfect for us – decide how much of the spicy cheese you want to use after tasting it and base it on how much you like spicy food! The taco meat here uses just 1/2 cup of tomato sauce – you can freeze the rest of the can of tomato sauce to use in a future recipe, or replace it with salsa if you like – just keep in mind that the salsa will up the heat factor even more in the pizza rolls. Some of the filling will spill out of the rolls when you slice them and place them on the baking sheet – don’t worry about it, just toss it on top of the rolls! Here are a few more great pizza recipes for you: Pull Apart Pizza Muffins, Buffalo Chicken Pizza, and Homemade Pizza Pockets. 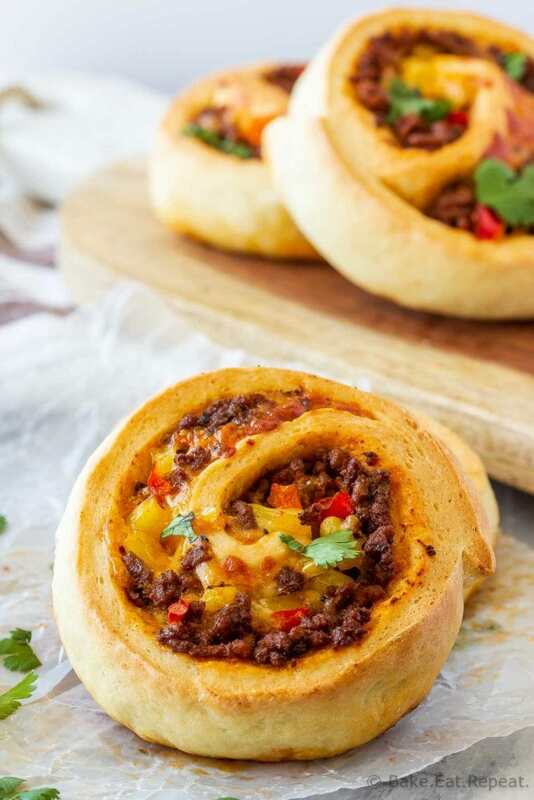 These taco pizza rolls are easy to make and taste amazing! Homemade pizza dough wrapped around taco meat, cheese and veggies - perfect for lunch or dinner! In a large bowl, or the bowl of a stand mixer fitted with the dough hook, mix together the water, flour, yeast, olive oil, honey, and salt. Pulse the mixture (or stir with a wooden spoon if mixing by hand) until it comes together into a ball. Knead for 5 minutes by machine, 10 by hand until the dough is smooth. If the dough is still looking dry and really shaggy after a couple minutes of kneading, add more water, a tablespoon at a time. If it is really sticky and not coming together into a smooth ball, add more flour, a tablespoon at a time. Cover the bowl and let the dough rest for 10 minutes. In a large non-stick skillet over medium heat, brown the ground beef, stirring constantly until no pink remains. Drain the grease and then add the garlic, chili powder, cumin, coriander, and salt and stir to combine. Stir in the tomato sauce and continue to cook, stirring, for another 1-2 minutes and then remove the pan from the heat. On a lightly oiled surface, roll out the pizza dough into a 1/2 inch thick rectangle. Spread the taco meat over top, leaving a 1/2 inch space along the edges. Sprinkle the corn and red peppers over top of the meat. Spread the Monterey Jack and cheddar cheese over top of everything. Roll up the dough starting on a long edge into a tight cylinder and pinch the seam (and the ends of the roll) together to seal it. Place the roll seam side down and slice it into 12 rolls. Place each roll, cut side down, onto a parchment lined baking sheet and cover the rolls loosely with plastic wrap. Let them rise for 15-20 minutes to puff up a bit and then bake for 25-30 minutes or until they are lightly browned and the cheese is bubbling. Let cool for 5 minutes on the baking sheet and serve warm. Leftovers keep well in the fridge and can be reheated gently in the microwave, or wrapped in foil and baked at 350F in the oven for 10 minutes. If you don’t want to make the dough from scratch, use enough ready made pizza dough for two 10” pizzas instead. Source: Adapted from my Pepperoni Pizza Rolls . I do actually do that most of the time - works great!